Have someone place the puppy on the floor approximately four feet from the tester, who is kneeling on the floor. The tester coaxes the puppy to him with his voice and body motions. A. Puppy runs to tester with tail up, jumps up. B. Puppy takes a few seconds to look around, then comes to tester, tail up. C. Puppy comes hesitantly, tail down. D. Puppy will not come at all; remains frozen in place. E. Puppy wanders off to explore room, ignoring tester. A. This puppy is bold and confident. He likes people. Will you mind a problem with your dog jumping up on people? Don't be taken in by this attractive response. Bold dogs are difficult to control. C. Puppy is less sure of himself, especially in a strange place, but still attracted to people. May be easier to control. See if pup's confidence increases as test progresses. D. Puppy is scared, intolerant of stress. Look for trembling to indicate degree of fear. This puppy may be shy of strangers. E. There may be two reasons for this response. 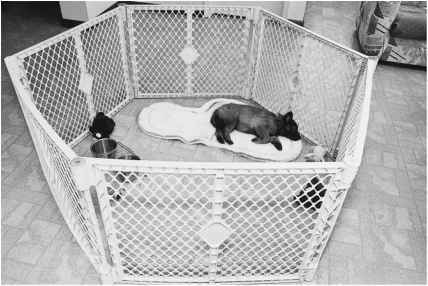 One is that the puppy is not a people-oriented dog, preferring to satisfy his own curiosity than to seek company. His independence may make him hard to train. The other reason for this response could be that the puppy is not attracted to strangers, but may still bond well to one person. 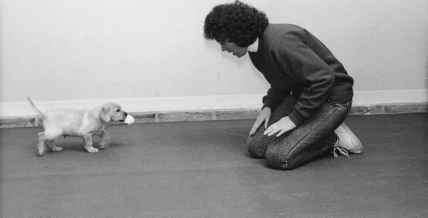 The tester stands up and walks away from the puppy, talking to the puppy encouragingly. Walk about 10 to 20 feet, if there is room. A. Follows readily, tail up, gets underfoot or runs ahead. B. Follows readily, tail up. C. Follows hesitantly, tail down. D. Does not follow; remains frozen in place. E. Wanders off to explore. A. While attracted to people, this puppy is also assertive. May need an equally assertive owner. B. Confident, but ready to follow owner, literally and figuratively. E. This puppy is independent and will be difficult to establish control of off leash. The tester gently places the puppy on his back and holds him there for 30 seconds. A. Puppy struggles fiercely, bites. B. Puppy struggles fiercely, may bark. C. Puppy struggles a little. D. Puppy does not struggle, relaxed. E. Puppy does not struggle, tense. A. Avoid this puppy if you have small children. Many children are bitten when they are restraining their dog by hugging him. This dog may be hard to restrain at the veterinarian. Early and firm training will be necessary. B. 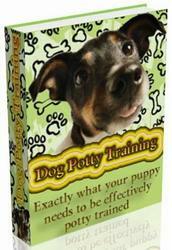 Indicates active, assertive dog, lacking in tolerance. D. This more passive, easygoing pup will be easier to handle. The tester sits the puppy beside him and pets the puppy, talks to him. A. Puppy climbs or attempts to climb up on tester's lap; jumps at face and licks. B. Puppy cuddles up to tester. C. Puppy sits quietly, accepting petting. D. Puppy crouches down, trembles. E. Puppy goes around tester, sniffing shoes, or goes away. A. The puppy loves people, but are his constant attempts to climb into your lap (and maybe everyone else's) or otherwise get your attention going to bother you? Will you enjoy it? C. This passive puppy is either a little frightened or aloof with strangers. E. Puppy is not attracted to people and independent. The tester crumples up a piece of paper and tosses it two to four feet in front of the puppy while he is looking. If he picks it up, encourage him to come back. A. Chases paper, grabs it, and runs off. B. Chases paper, sniffs it, runs off. C. Chases paper, picks it up, and returns to tester. D. Approaches paper hesitantly, stretches nose to cautiously sniff paper. E. Chases paper a short distance, but returns to tester. F. Not interested; wanders off. G. Refuses to leave tester. A. Puppy may always chase things he sees, like dogs on the other side of the road. He is also exhibiting independence. B. Same as above, with less retrieving instinct. C. Good response; retrieving correlated with high trainability. 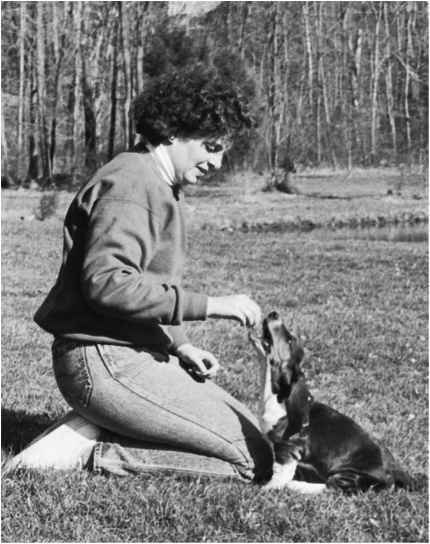 D. Puppy lacks confidence, but may retrieve with practice and encouragement; may also indicate pointing ability in bird-hunting dog. E. Indicates high level of social attraction and less retrieving instinct. F. No retrieving instinct, puppy will probably not play retrieving games; indicates independence and reduced trainability. 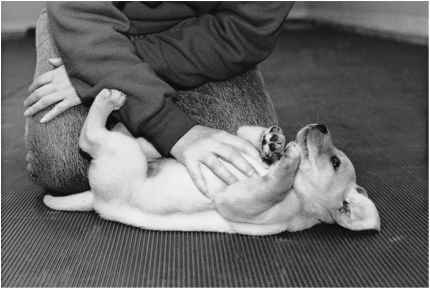 The tester cradles the puppy in lap, takes webbing between front toes between thumb and forefinger, and gradually increases pressure while counting to 10, stopping as soon as the puppy pulls his paw away. Some dogs are more pain sensitive than others. Dogs who are not pain sensitive may be hard to train by traditional methods that rely on dog's discomfort. A common problem with such dogs is pulling on the leash. Other dogs may be pain sensitive and overreact to every touch, perhaps nipping when a hair gets pulled while being brushed. A middle response is desirable. Most dogs are relatively pain insensitive. The tester hits the bottom of a metal pan with a metal spoon while the puppy is a few feet away. Set the pan on the ground after hitting it. A. Puppy locates sound and trots to pan to investigate. B. Puppy looks toward direction of sound but doesn't walk toward pan. C. Puppy cringes, runs away, and tries to hide. A. Puppy is bold and confident, not sound shy. B. Puppy is less bold, but not sound shy. C. This amount of fear indicates sound shyness. A sound shy dog can panic during a thunderstorm, or run away when a car backfires. This would be a big problem for a hunter. 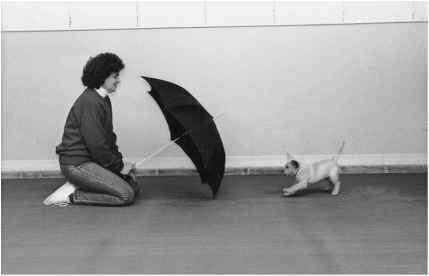 The tester opens an umbrella held close to the ground about four feet away from the puppy and sets the umbrella on the ground. A. Puppy may or may not jump back, but then approaches umbrella on own; may mouth umbrella. B. Puppy may or may not jump back; approaches umbrella with encouragement. C. Puppy cringes, goes away, and tries to hide. A. Puppy very bold and curious, not afraid of things. B. Puppy less bold but not afraid. C. Puppy afraid of strange-looking objects; often grows up to be a dog easily "spooked." A. Mostly runs about, never stops. B. Mostly trots, mildly curious. C. Walks quietly about, remains in position tester puts him in. D. Moves very little, tense. A. High energy level. Will be hard to keep quiet and will need a lot of exercise. B. Medium energy level. Will still need exercise. C. Low energy level. Easy to live with. This 10-week-old Basset Hound puppy is learning to sit with food.